The students of Marjory Stoneman Douglas High School in Parkland, FL, have become the leaders of a national movement. Their goal is to force conservative legislators across the country to change gun laws. But the students may “succeed” in ways they won’t like. Because if there is one thing we have learned from the personal attacks on the Parkland students — from fake videos and smears to baseless accusations — it’s that they have scared their political opponents. The result may be sweeping changes to legislation in various states. But it may not be gun laws that get changed — but rather laws that will make it more difficult for young Americans to vote. Because if emerging leaders like Emma Gonzalez and David Hogg, the main targets of the ongoing smear campaign, succeed in getting young people to the polls — or turning large numbers of gun control supporters into single-issue voters — they are becoming a major threat to Republicans on the state and federal level. In the past, it was easier to overlook millennials as a political force. They were not the largest voting bloc and didn’t show up on Election Day. In 2016, an anemic 49 percent of millennials voted. In addition, while they were more likely to identify as Democrats than Republicans, the difference (54 percent to 33 percent) wasn’t as pronounced as in other demographics that are usually the targets of GOP voter suppression — such as African Americans, who vote for Democrats in overwhelming numbers. But all of that is about to change. With more millenials getting old enough to vote each day, they could soon become the largest voting bloc — if they show up at the polls. And there are some indications that they want to, spurred by deep dissatisfaction with President Donald Trump and GOP policies on key issues, such as guns. A poll conducted earlier this year shows that millennials are more eager to vote than in previous midterm elections. And in just two years, the Democratic advantage in the demographic has jumped 12 points, with 62 percent now favoring Democrats and 29 percent favoring Republicans. Even worse for Republicans is that this poll was taken before the Parkland shooting, which seems to have galvanized even more young people. So the writing is on the wall for the GOP. And, if history is any indication, Republicans will be more willing to change voter laws than their policies. As WhoWhatWhy has reported, election integrity experts believe that GOP lawmakers on the state and federal level will try to make it more difficult for millennials to vote. For example, they could curb opportunities for pre-registration, same-day registration, and early voting. Or they could require that a voter’s photo ID must show the voter’s current address, which would, for example, greatly affect millennials who just moved out of their childhood homes, e.g., to go to college. These measures make it much more difficult for casual voters to cast a ballot, but they will not stop organized people who are committed to vote. Of course, voting shouldn’t just be for those people who have the time and means to overcome obstacles that were placed in their path by a party determined to cling to its majority for as long as possible. Every eligible voter who wants to cast a ballot should have the opportunity to do so. That is why gun laws that don’t reflect how the public feels are a symptom and not the disease. The real problem is laws that keep Americans from voting. If the Parkland students want to lastingly change the country, they won’t stop at universal background checks or bump stock bans. They’ll keep on marching for a Right to Vote amendment, automatic voter registration, getting money out of politics, and laws that outlaw partisan gerrymandering. It’s the only way to ensure that their voices will be heard when it matters. 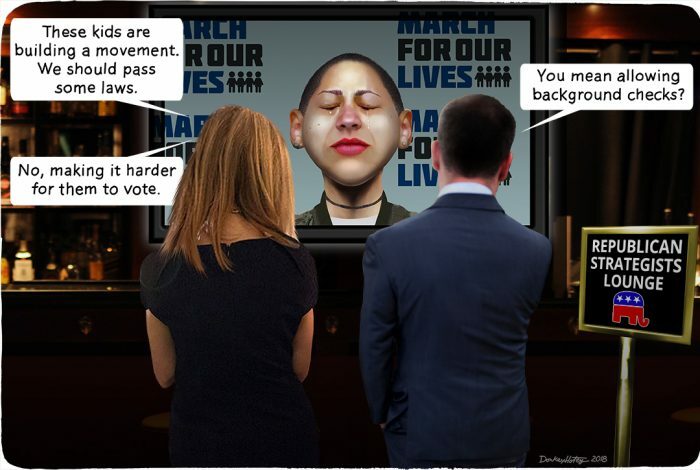 The cartoon above was created by DonkeyHotey for WhoWhatWhy from these images: Emma González caricature (DonkeyHotey / Flickr – CC BY 2.0), man (Obama White House / Flickr), woman (Obama White House / Flickr), bar (l.blasco / Flickr – CC BY 2.0), and GOP logo (Republican Party / Wikimedia).